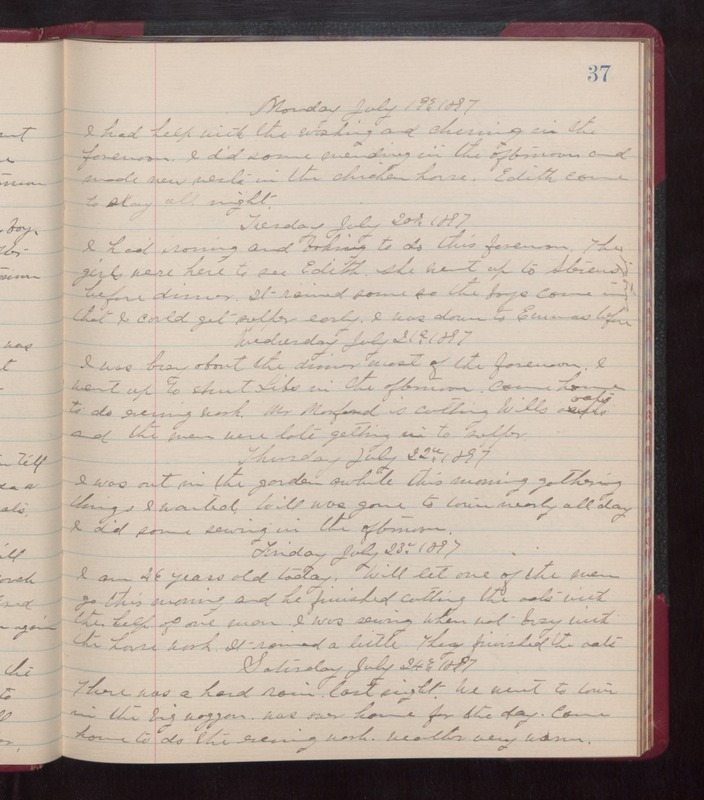 Monday July 19th 1897 I had help with the washing and churning in the forenoon. I did some mending in the afternoon and made new nests in the chicken house. Edith came to stay all night. Tuesday July 20th 1897 I had ironing and baking to do this forenoon. The girls were here to see Edith. she went up to Stevens before dinner. It rained some so the boys came in that I could get supper early. I was down to Emmas twice before night. Wednesday July 21st 1897 I was busy about the dinner most of the forenoon. I went up to Aunt Libs in the afternoon. Came home to do evening work. Mr Monford is cutting Wills oats and the men were late getting in to supper. Thursday July 22nd 1897 I was out in the garden awhile this morning gathering things I wanted. Will was gone to town nearly all day. I did some sewing in the afternoon. Friday July 23rd 1897 I am 46 years old today. Will let one of the men go this morning and he finished cutting the oats with the help of one man. I was sewing when not busy with the house work. It rained a little. They finished the oats. Saturday July 24th 1897 There was a hard rain last night. We went to town in the big waggon. was over home for the day. Came home to do the evening work. weather very warm.